Lazercraft have been offering alloy hulls married to fibreglass decks and cabins for a decade. Geoff Green went to the Bay of Islands to see how the composite combination came together in the 720GT Hardtop. 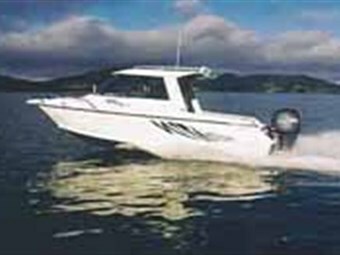 Gavin Childs began producing alloy boats under the Lazercraft brand in 1984 and they released their first composite boat - the 560 - at the 1991 New Zealand Boat Show. It won an award for Best Sport Fishing Boat and the alloy fibreglass mix has been well accepted by the public since. Gavin says the marriage of a glass top and an alloy hull offers a number of positive advantages. The flowing lines and compound curves that can be achieved using fibreglass allow Lazercraft to build a very stylish design. In a production sense, it's not economic to produce curvaceous shapes in alloy. "By blending the two mediums we can produce a stylish boat that the ladies like without sacrificing the hard-wearing aspects demanded by fishermen and divers. The hull can still be beached or bounced on a ramp without too much concern and the checker-plate floor will repel dive bottles and weight belts without showing damage." Other positives are: the electrical and electronic circuits are installed in the glass top, isolated from the alloy hull should there be any current leaks, and fibreglass is warmer to the touch than alloy. The 720GT Hardtop I looked at was Lazercraft's demonstrator before Dean Fraser and Russell Martin bought it. 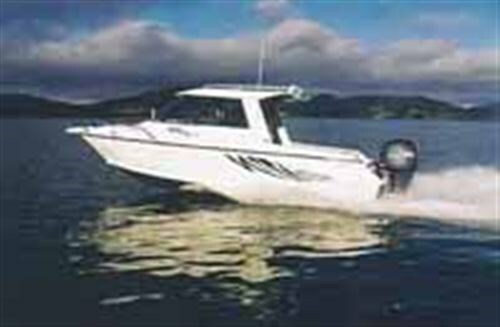 Both are keen fishermen and they were happy to invest in twin engines for safety and reliability's sake. Gavin says the recommended power for the boat is between 175hp and 250hp and that in the upper range he prefers to see counter-rotating twin rigs rather than a big single fitted. "It goes well with twin 90s upwards," he says. Dean says the 720 is a little narrower at the chine than some of its opposition, and may be a touch livelier at rest, but it goes through the water very well. I accompanied Dean and Russell for a day's fishing. We left Waitangi at dawn and head-butted our way out to Red Head in a moderate easterly. The sea conditions were choppy and a base swell rolled in from the Pacific but the boat cruised very nicely at 4100rpm, which gave around 22 knots. The twin Yamahas - alias, the Stealth Engines - ran quietly and smoothly. When I mentioned the subdued engine noise, Dean commented that the fibreglass deck and hardtop also contributed to the boat's quiet overall running. The 720GT is fibreglass from the gunwhale up (deck cabin and hardtop) and the alloy hull is built using 5mm marine-grade plate on the bottom, 4mm on the sides and transom and 3mm for the tread-plate floor. The cuddy cabin can be closed off for privacy and security using a combination of bi-fold teak doors and a hinged fibreglass hatch in the dash. The hatch obscures the lower portion of the centre windscreen when it's raised and the bi-fold doors extend into the passenger's space so Russell and Dean tend to do their travelling with the cabin closed off. The cuddy is lined and has two bunks with an infill that allows a child to sleep between two adults when the boat is used for over-nighting. During our day trip the cuddy tended to be a dumping ground and we did all our living in the hardtop and cockpit. The hardtop was a real bonus and it offered good headroom, vision and protection from the elements. Lazercraft have provided sufficient headroom and kept the 720 looking relatively low and stylish by keeping the floor level low. The sealed checker-plate floor is below water line at rest and any internal water is run-off into a sump equipped with a 1500gph bilge pump. Lazercraft pressure test the underfloor cavity to ensure it is leak free and will provide long-term reserve buoyancy. Because the floor is relatively low the 720 has reasonably high internal freeboard. I could lean my upper-thigh against the side coamings and Dean says this aspect is a plus because it offers good security for their children. Seating is provided by two fibreglass modules that have a forward-facing helm seat mounted on top and a rear facing cockpit seat moulded into them at the rear. The hardtop is equipped with a Perspex windscreen and sliding glass side windows. An overhead bulkhead provides a weatherproof mounting point for a VHF, tape deck and a couple of down-lights. The dash fits all the instruments required for a twin installation and there is plenty of small-item storage provided in various side pockets, glove box and trays on the dash. The 720 features a built in platform and the aft cockpit coaming is cut down on the port side to give easy access to it and the dive ladder. There are three lockers across the stern. Lazercraft build their own alloy trailers and the 720 sat on a tandem axle version fitted with durotorque suspension. 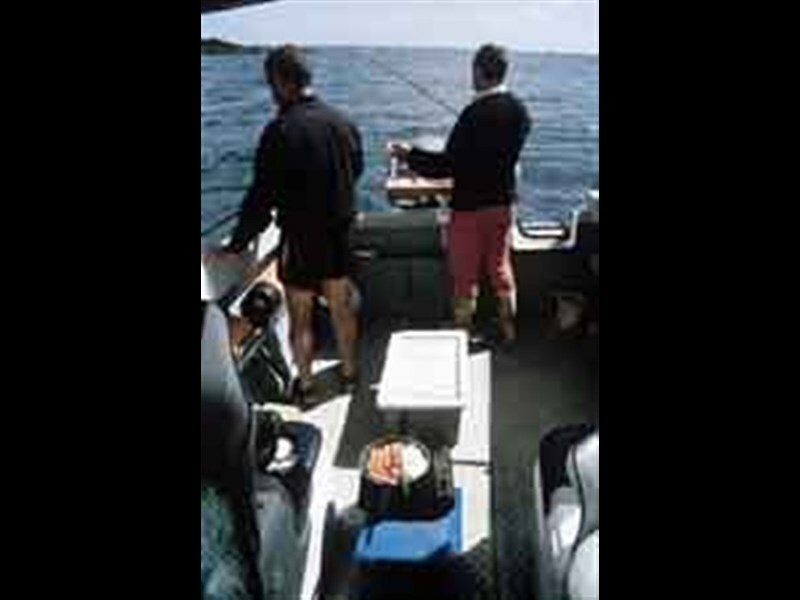 Dean and Russell opted for over-run braking on both axles because they share the boat and one lives in Auckland and the other in the Bay of Islands. Consequently the boat will see a fair bit of tar seal slide under the keel and they wanted hassle-free towing. The factory specifications list the towing weight as 1962kg dry and Dean says he thinks the towing weight is about 2200kg all up. I had a chance to briefly drive the boat in flat water but it takes a while to learn how to trim twin engines to best advantage. One trim button on the port throttle trimmed both engines simultaneously and there were individual trim buttons for each engine on the console. I could trim the engines individually to provide a bias to counter side winds and seas (just as you can with trim tabs), but I probably didn't have everything set up as sweet as it could have been for optimum speed and fuel economy. I found the easiest way to get close to the groove was to synchronise the engine trim, set the boat up fore and aft and then apply a bit of tab to counter the wind. Russell says he considers tabs should be standard equipment on any 7-8m hardtop and he wouldn't want to run the 720GT without them. The GPS showed a cruising speed of 22 knots in flat water at 4000 rpm and 26 knots at 4250. Dean says they usually cruise between 4500 rpm in the calm and 4000rpm in the rough.